We have selected the following packages for their Economic Popularity and suitability to many home applications. These Marine Ready Packages include the Glass aquarium with black overflow box, Black or Cherry Finish wood stand and canopy, Sump filtration, external pump, plumbing, Araga-Alive Sand, and LED lighting. For a limited time these package prices include FREE local delivery and set in place when you mention this web promotion. Of course some restrictions may apply to free local delivery like, going up or down 2 or more stairs, difficult or obstructed access that is not simply reached by a four wheel dolly. Feel free to contact us for details. These marine ready packages do not include salt water, decorations, or any advanced filtration options. These are basic residential grade, home hobbyist maintained, filtration systems that will certainly support aquarium life, however there are certain upgrades available to enhance the aquarium environment. Feel free to contact us for details. 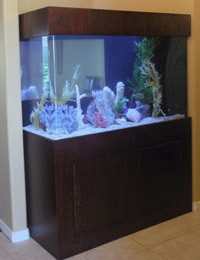 Arrangements can be made for Custom Marine Aquaria aka ArizonaFishGuy.com to do the plumbing and life support installation as well as supply the other necessary items to be ready to stock with marine life. These marine ready packages can be easily installed by the handy do it yourself person as well.